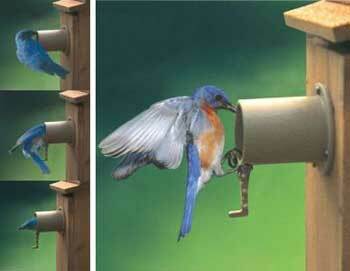 Protect baby birds from predators by installing a guardian tube in any 1-1/4 to 1-1/2 inch house entry hole. Tail support promotes easy entry for qualified entrants! Permanent 3-screw mount. Available in most bird specialty stores and many garden centers, or go to Duncraft Birdhouse Guardian on the Internet.